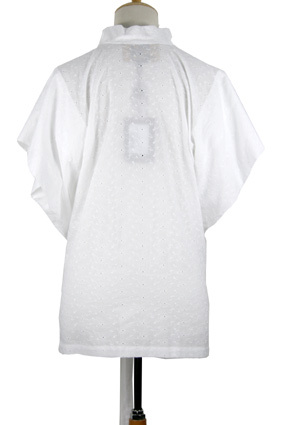 Vivienne Westwood Anglomania 'Bee Blouse' in white cotton broderie anglaise (embroidered). Sleeveless but armholes are deep and folded doubled fabric. Pull-over style with fabric tie at front. Small pointed collar. Nice folded fabric detail.